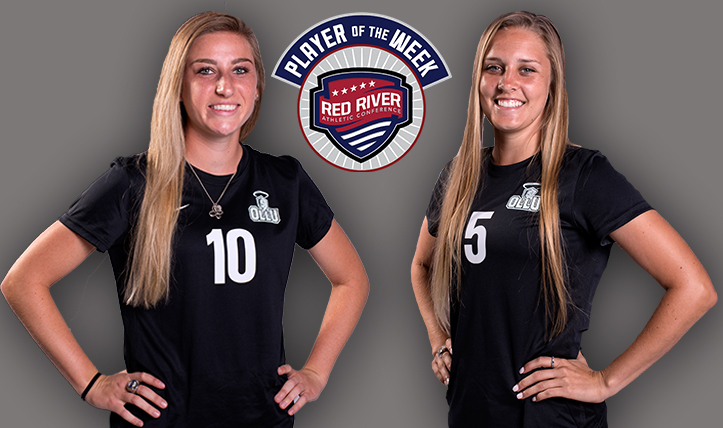 Our Lady of the Lake University (OLLU) has claimed two more Red River Athletic Conference (RRAC) player of the week awards which were announced by the league office on Tuesday. 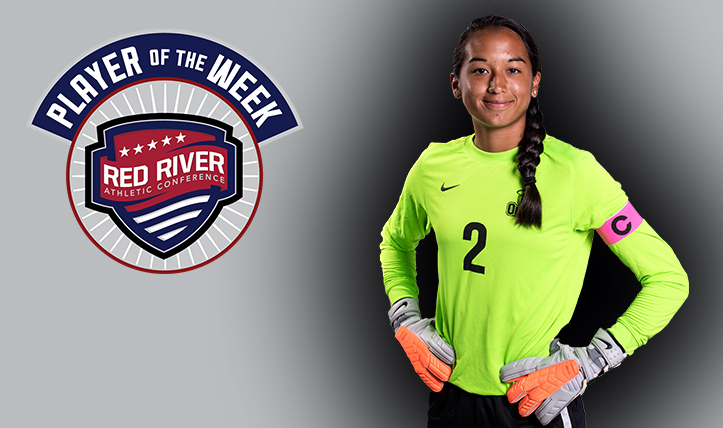 Women’s goalkeeper Gabriela Lopez won the defensive player of the week while men’s defender Angel De la Garza won the men’s version of the award. 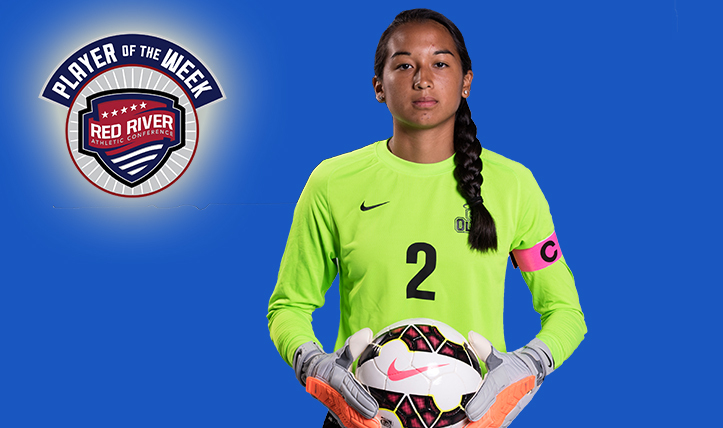 Lopez only needed one match this week to claim the award as she managed a clean sheet in the 3-0 win over Huston-Tillotson. That result gave Lopez a new OLLU soccer record as that was her 12th career clean sheet to create a new career record. She managed four saves throughout the match, managing a full 90 minutes in the result giving her her 11th win of the season. She currently sits second in the conference for goals allowed with a 0.76 mark, as OLLU sit top of the table. De La Garza leads the backline of the Saints’ men’s team and another strong performance at the back gave De La Garza the award on the men’s side. The men also managed a shutout against Huston-Tillotson, winning that match 7-0. In marshalling the OLLU defense De La Garza helped keep Huston-Tillotson down to just one shot on goal through the 90 minutes. De La Garza also proved useful going forward, often providing the link between defense and attack to kick off plays. 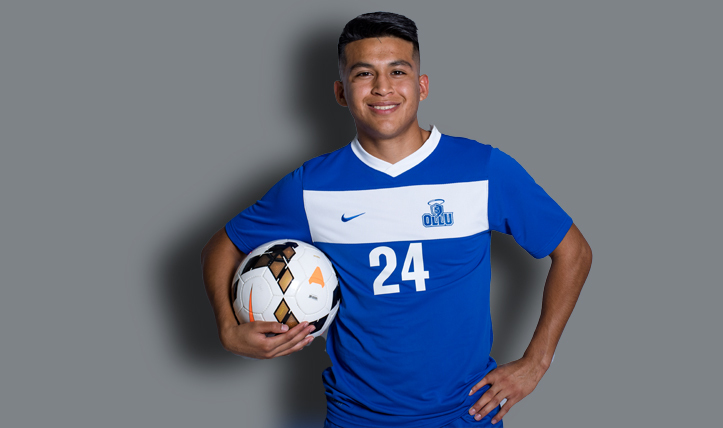 It was the second straight week that an OLLU player had won the men’s defensive player of the week award after Jorge Cavazos won a week ago. For the women it’s the first win since August 29th when Maggie Miller won the award in the opening week. 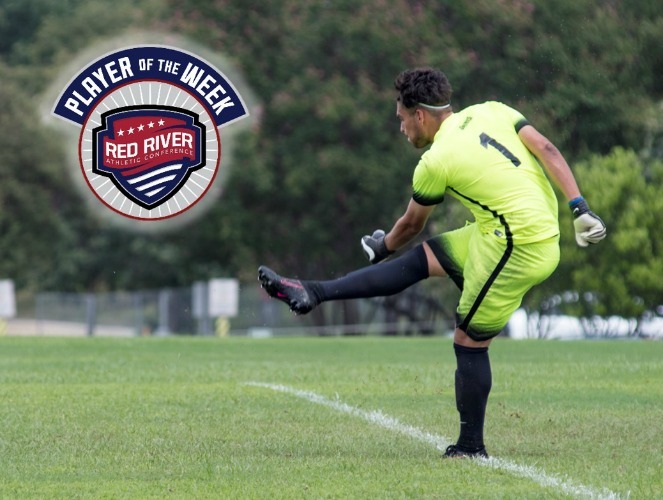 For the second week this season Our Lady of the Lake University (OLLU) men’s goalkeeper, Jorge Cavazos won the Red River Athletic Conference (RRAC) defensive player of the week. Cavazos is quickly making a case for the RRAC defensive player of the year, having won two of the seven weekly awards so far, and he is currently the only player to win a weekly award in RRAC twice. Cavazos had a strong week, keeping two clean sheets throughout the weekend as the Saints remain top of the league. The Saints managed a 3-0 win over Jarvis Christian College midweek before holding Texas College to a scoreless draw. The clean sheet against Texas College is especially impressive as the offensive player of the week, Confidence Ogo, managed to win the offensive player of the week. That was on the back of scoring a hat-trick in their match on Thursday, having him on fire ahead of the match against OLLU. Cavazos only needed one half in the Thursday match against Jarvis Christian, only needing to make one save throughout the 45 minutes he played. Against the Steers Cavazos played the full 110 minutes, making six saves throughout the match. The case for Cavazos to win the defensive player of the year is a strong one as he continues to impress this year. Cavazos leads the conference with a 0.63 goals against average and he also has four shut outs, as OLLU has not lost a conference match so far this season. Hugo Plascencia was a nominee for the offensive player of the week for OLLU, scoring a goal in the midweek match. But up against a strong Ogo performance, it was hard for anyone other than Ogo to win the match. 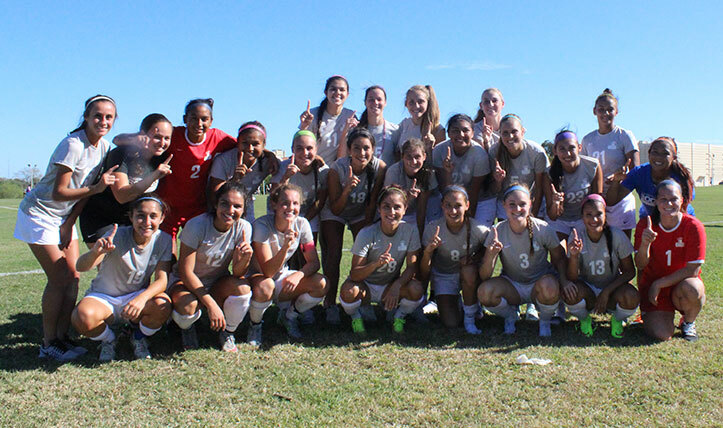 What is fast becoming a tradition in San Antonio soccer, the second annual ‘Halo Classic’ saw Our Lady of the Lake University (OLLU) win the match. OLLU hosted St. Mary’s on Tuesday afternoon and managed a 2-0 win over the Rattlers. The result marks the first time that OLLU managed a victory over St. Mary’s, after five matches between the two San Antonio catholic universities. With OLLU receiving votes in the NAIA top 25 poll, they made a strong statement beating the NCAA Division II side. After just missing out on winning the Red River Athletic Conference Offensive Player of the Week award last week, Brooke Cousins came out determined. OLLU was having the earlier opportunities but the physicality of the Rattlers was proving stifling with Cousins fouled multiple times in the opening minutes. There were early chances from St. Mary’s but Gabriela Lopez was doing well in the Saints goal to keep the visitors out. That allowed OLLU to take back over the match and they were able to open the scoring in the 17th minute when Jackie Lambarida recovered a rebound from Erica Robertson’s shot. That allowed Lambarida to square the ball for Robertson who made no mistake on the second chance. It could well have been two for the saints in the 24th minute after some continued good work from Cousins. She found space and got a powerful shot away, beating the keeper but could only find the crossbar as OLLU started to really control the match, which continued out for the rest of the half but they couldn’t score again, keeping it 1-0 at the break. St. Mary’s were starting the second half well, challenging for chances early on, but they were unable to take chances. In the 57th minute OLLU was able to double their lead after the shot hit the post Grayson Manfredo reacted fastest to redirect it in to the goal to make it 2-0. That saw the second half fade, as OLLU really looked to just take the threat from the Rattlers out of the match. OLLU could have made it three in the 73rd minute through Lambarida but her shot could only find the post. St. Mary’s tried to challenge late on, getting the bulk of the chances but they could not break down the Saints defense. The best late chance came from OLLU in the 84th minute as they hit the post again as Amaris Tavares hit the post with her shot. 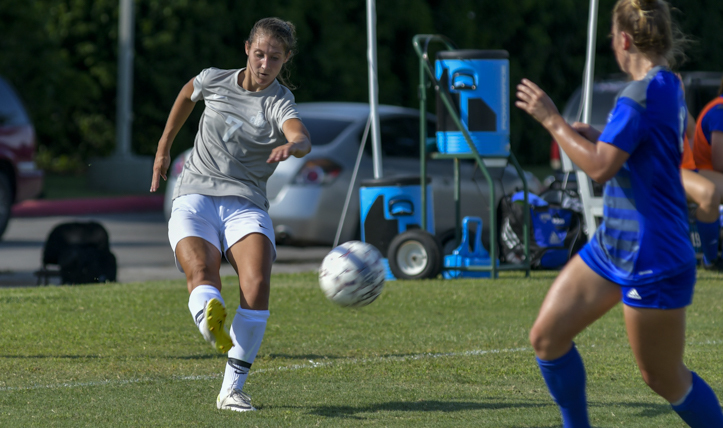 Our Lady of the Lake University (OLLU) women has continued their good form as they managed their sixth straight shutout win on Sunday. The Saints managed a 2-0 win easily against NCAA Division III side Schreiner University in Kerrville. It didn’t take long for the Saints to get control of the match as they went on the attack from the opening whistle. Jackie Lambarida was a main target for OLLU as she was leading the shot count in the early stages but her finishing was wayward. The wasteful finishing was looking like staying the story of the half as the Saints were unable to break down the Mountaineers. But in the 39th minute the Saints finally broke through when Erica Robertson found the back of the net, sending OLLU in to the half ahead. Things followed much the same trend in the second half as OLLU controlled the chances throughout the second half. Despite that Schreiner had the best chance in the 67th minute as Victoria Favela got space to get a shot away and beat the keeper with her shot but could only find the crossbar. But OLLU eventually got through for the goal to seal their win as Victoria Castro was able to get the ball in to the back of the net. That required Schreiner to go for the match and they went to the bench looking to bring on attacking players. Despite those attacking change, the Saints were still dominant as they kept on attacking and kept hunting for goals. That gave OLLU an easy 2-0 victory that could well have been bigger had they have been more clinical with their finishing. After the first week of play in the Red River Athletic Conference (RRAC), OLLU has swept all four weekly awards after dominating this weekend of play. Both the men’s and women’s offensive and defensive player of the week awards went to OLLU players after a strong start to the season. Marco Perales won the men’s offensive player of the week after a strong performance to open the season when he managed two goals and an assist in the season opener on Friday. That puts him level for the conference goal lead with team-mate Oscar Cordova, but his assist pushed him over the edge. The men’s RRAC defensive player of the week award went to Jared Poling, who was crucial in defense for OLLU. Texas A & M Texarkana managed only one shot through their match with the Saints with Poling a vital defender. That Brooke Cousins won the women’s offensive player of the week was no surprise after her stellar offensive performance on Sunday. Cousins broke an OLLU record when she scored five goals in the 11-0 win over Bacone, scoring four goals in a row as part of that run. 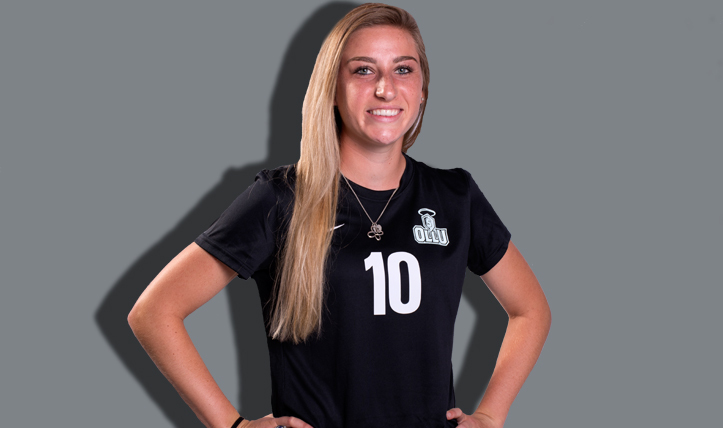 Maggie Miller captained OLLU in their two matches this weekend marshalling the defensive line at the Border Cup tournament at Texas A&M Texarkana. Her efforts gave OLLU the win in that tournament as they easily restricted their opponents, keeping them scoreless, and almost shotless throughout that weekend. An absolute bagful of goals to Brooke Cousins helped OLLU power past Bacone College for the biggest victory in school history on Sunday. OLLU managed a huge 11-0 win to keep their perfect start to the season going in emphatic fashion. It took just three minutes for the Saints to open the scoring as Maryssa Garza was able to get the ball in the back of the net after some good build up play. After such a start the warning signs were there for Bacone, but they failed to really head them as OLLU just kept coming. Ten minutes later Cousins had the first of her five goals of the night as she easily buried her chance. It didn’t take long for Cousins to seal her brace as she scored her second just two minutes later as she booted in the third of the night and her second. The Bacone keeper, Alyssa Howard, finally started to get in to the match after that third goal from the Saints as she made three saves. That, coupled with some wayward finishing, kept OLLU off the scoreboard until the 40th minute with Cousins wrapped up her hat-trick with a well struck goal. It took just two minutes of the second half for Cousins to score her fourth, goal of the match as she scored one minute and 19 seconds in to the half. That gave the Saints a five goal lead and saw Bacone really throw all players behind the ball in an effort to stop the bleeding, despite goal difference not being a factor in college soccer at all. But the resistance did not hold out forever as Pauline Fields was able to score in the 64th minute for OLLU’s sixth. Ten minutes later Cousins returned to score her fifth, and final, goal of the night to push OLLU’s lead out to six. Scoring five goals in a match sees Cousins break a school record, as she is the first Saints player to score five goals in a match, and equals the shots on goal record with seven. After some missed opportunities from Reyna Garcia, OLLU made it eight in the 81st minute from a goal through Maryssa Garcia. Things got even worse for Bacone three minutes later when Kallie Smith sent the ball past her own keeper in an attempt to clear to give OLLU their ninth. With four minutes to play OLLU sent the match in to double figures through Grayson Manfredo scoring her first of the season. Just two minutes later the match finished 11-0 when Thirley Rodriguez scored the final goal of the rout. The OLLU men’s soccer team has got off to a perfect start as they demolished Texas A&M Texarkana (TAMUT). It was quite a welcome to the Red River Athletic Conference for TAMUT who were thumped by the Saints 6-0 in a crushing victory in Texarkana. Despite the hefty score line for OLLU, it took some time for the scoring to get started as TAMUT held out got almost half an hour. Marco Perales was able to find space in the 29th minute which allowed him to create the goal, scoring with a solid finish. That started things and in the 41st minute Nickolas Tyrpak, younger brother of former San Antonio Scorpion Kris Tyrpak, found the second. Tyrpak doubled the lead with his own quality finish to make it a 2-0 lead to the Saints at half-time. After it took a long time to score in the first half, the Saints wasted no time in the second half as they were able to make it three in the seventh minute of the half. That goal came through Perales who wrapped up his brace to all but seal the win. In the 62nd minute the Saints were able to make it four when Jonathan Garay was able to bury his chance, as OLLU kept on attacking. Just two minutes later the Saints were able to make it five through a first goal for a collegiate debut goal from Oscar Cordova. After a bit of a break between goals, Cordova was able to score his second career goal when he scored in the 80th minute. TAMUT had only one shot on target through the match, which was easily saved by the Saints keeper as they cruised through to the 6-0 win. The OLLU Women’s Soccer team has received a pre-season national ranking in the 2016 NAIA Coaches’ Pre-season Top 25 poll. This sees the Saints achieve their highest ranking since the 2014 pre-season poll where they were ranked 19th. The Saints were last placed at 22 in the 2015 postseason poll, but in the offseason their moves have led to a rethink from the coaches. The top team is unsurprisingly Spring Arbor, the defending champions, but the team at the top of the pre-season poll has not won the title since Lee in 2011. OLLU received 153 points well clear of the 22nd team, Reinhardt (with 137) and in touching distance of Olivet Nazarene who are 11 points ahead. The Saints will be hopeful of a strong season as they look to continue making history, fighting for their furthest ever NAIA Championship run. The ranking sees OLLU as the only team from Texas in the top 25 with most of the teams in the rankings coming from mid-western states or California. The nearest team to OLLU that was mentioned in the rankings was Oklahoma Science and Arts who just missed out on getting a ranking, being in the non-ranked group. The Red River Athletic Conference is only represented by OLLU in the top 25, with the Saints being the only RRAC team to receive votes. When looking at the conference break down, OLLU are expected to be challenged by St. Thomas or Houston-Victoria for the conference title, reflecting the standings of conference play in 2015. Another San Antonio college derby took place on Tuesday night as Our Lady of the Lake University took on Trinity at Paul McGinlay Soccer field. It was the eighth straight season opening win for the Trinity women as they claimed a tight 1-0 victory. Five goalkeepers were used in the match as both teams took advantage of the fact that this match was a friendly. Trinity used all three of their goalkeepers, with Jane Thompson and Dana McLaughlin both recording a save while OLLU used two keepers. The score line would suggest a tight match, but the Tigers were definitely the stronger side as they outshot the Saints 28-2. Despite that the edge in shots on target was much tighter as Trinity only lead 10-2. With statistics like that, OLLU can be proud of their defense, as both schools will look to threaten in to their respective national championship. While Trinity got the win OLLU came out happy at having executed their plan well. After having plenty of the attack in the early going the goal finally came in the 34th minute. Alison Carter sent in the cross which found Halleanne Dure, who scored her first goal as a Tiger, capping a good run for Trinity. But that proved to be just a momentary blip for the OLLU defense as they continued to hold firm though the remaining ten minutes of the half. That allowed the Saints to remain in the match at half-time as the OLLU defense did a good job keeping it 1-0 at the break. The second half saw the two trends continue as the Tigers went for the match, but they just could not break down the OLLU defense. OLLU were strong in defense and kept holding out Trinity throughout the second half. What was especially impressive was the ability of the OLLU defense to hold out Trinity without giving away any set-pieces. With no corners or free-kicks that limited the dangerous opportunities the Tigers had, but the Saints failed to create many chances as the match ended 1-0.